Lighten up your summer, spring wardrobe with these easy pieces from The White Company, including a striking Linton tweed jacket in heritage tweed as used by haute couture houses made in Britain, very easy to wear boyfriend jeans in a soft neutral colour and the off the shoulder Bardot jumper makes a great easy to wear piece which can be dressed with tailored trousers or off duty with your jeans. Made with Linton tweed – a heritage British fabric manufacturer used by some of the world’s most famous Couture houses – this edge-to-edge jacket comes in a straight, boxy fit. They have added fringed details along the opening, on the cuffs and atop the two patch pockets, lending it a contemporary feel that’s as at home over a dress for Spring weddings as it is worn with a casual look of jeans and a jersey T-shirt. This blazer is made with a blend of linen and tencel, woven in Italy, which gives it a really soft finish and slight sheen with flecks. In a single-breasted design, with stab-stitch detailing along the collar and welt pockets, this will smarten up a Summer dress, or add a Scandi-feel to your look when teamed with a cotton T-shirt and ankle-length trousers. A great modern throw-on for Spring days, this jacket comes in on-trend khaki. A stand-up collar contrasts the drapiness of the rest of the jacket, while flap pockets and twin-needle stitching add to its utilitarian appeal. Use the waist-defining drawstring ties to pull in the slightly loose silhouette or wear open over denim and a white tee. This beautiful Bardot-neckline jumper has been made with a super-flattering cowl-neckline that casually twists and drapes across the shoulders and décolletage. In a soft and enveloping wool-blend, with a dash of cashmere, the fabrication lends itself perfectly to the romance of this draped style. We’ve engineered the neckline to fall perfectly over the shoulders, making it easy to style and wear. These Brompton cut are a feminine take on boyfriend jeans; with a soft mid-rise they are comfortably relaxed without being too oversized, the authentic denim is still soft to the touch with just the right amount of stretch. This gorgeous jumper is knitted from a soft cotton-and-wool blend and detailed with front ties to accentuate its relaxed, easy-going silhouette. 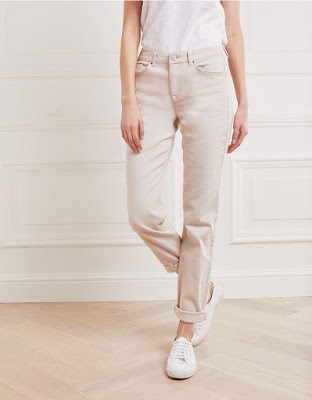 If you loved the White Company’s Utility Trousers from last year, you’ll love this updated style. They have listened to your feedback, and crafted this pair with a structure-meets-stretch cotton-rich fabric – which ensures they really do hold their shape after lots of wear. 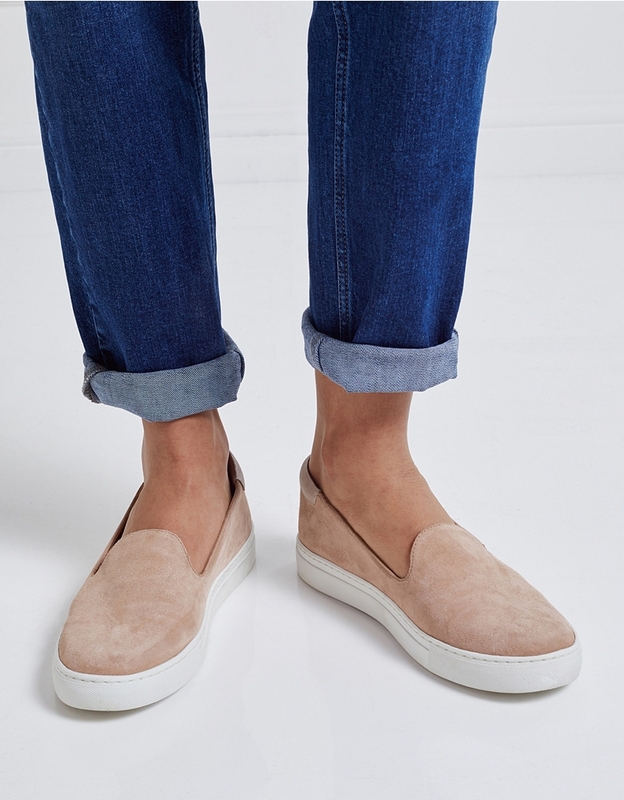 With a slim leg and utility details, these are really easy to style. 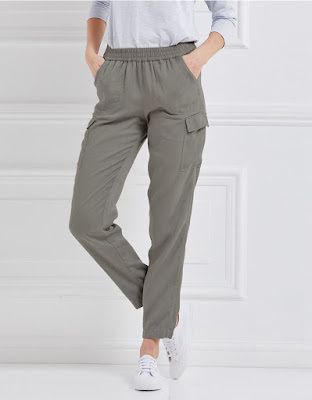 A Spring update to the White Company Cargo Trousers, this pull-on pair are made from fluid Tencel, with a drapey, utility-inspired feel. Featuring an elasticated channel waistband and side-flap pockets, these look effortless styled with a cotton-slub tee and trainers. These slip-on trainers are the epitome of versatility. Made from soft suede and lined in leather, plus an elastic insert, they pull on and off easily and are the perfect choice for pared-back style throughout on-the-go days. A branded rubber sole and padded inner ensure these are wonderfully comfortable, while a low-cut vamp creates an elegant shape.